Niche line Bond no. 9 will launch I Love New York for Fathers in June and I Love New York for Marriage Equality in July. They are the sixth and seventh fragrances respectively in the I Love New York series created in collaboration with the state tourism agency of the same name. I Love New York for Fathers ~ "I LOVE NEW YORK for Fathers, An easy-to-wear, easy-to-love fragrance. Bond No. 9’s newest eau de parfum celebrates the vivid, fast-paced, swashbuckling breed of male-ness that built and defined the Empire State." With notes of basil, lime, coriander, lavender, sage, grapefruit blossom, treemoss, musk and amber. 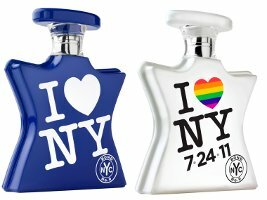 I Love New York for Marriage Equality ~ "I LOVE NEW YORK for Marriage Equality, An easy-to-wear, easy-to-love fragrance that honors New York proudly setting the global pace in celebrating love, marriage … and civil rights." With notes of mandarin, nutmeg, plum, rose, jasmine, ginger lily, cashmere wood, sandalwood and amber. Bond no. 9 I Love New York for Fathers and I Love New York for Marriage Equality will be available in 50 ($105) or 100 ($175) ml Eau de Parfum. You know, if part of the proceeds of sales were being donated to these two, I would say, fair play. But this doesn’t seem to be the case and more and more I just think Bond is spreading itself real thin with scents for just about everything under the sun. It just seems like a cynical revenue generating move. Or I’m just grumpy. If you’re grumpy, then I’m grumpy too, as I agree with your statements 100%. I do not know why they’re doing so many in one year for this new license, but agree, it would seem better to move slowly. Not sure what their agreement is with I Love New York — maybe they are the ones who want them all done so quickly? Or I suppose it sounds like the Vatican trying to be hip. Weirdly I could see that in the Vatican gift shop. The concept of the line is about New York City it wouldn’t make sense for Massachussetts to be involved in the moniker. So a scent to celebrate marriage equality should smell of tea (in honor, of course, of Boston’s famous step forward in anti-colonoialsim) and cranberries? Yeah, I didn’t know NYC was the preferred city of pirates. I purchased Bond’s I LOVE NY for All last year and Earth Day just yesterday at Saks; My sales rep told me that proceeds from the fragrance line go to the New York State’s Empire State Development- i love when companies give back to help support a greater cause. I sniffed the Marriage Equality at Elements and I would have bought a bottle on the spot if I could have. Yes, I know people are going to complain about the co-opt thing, but it smelled really special. Bad news – we have to wait until July for it to come out. Whether it was a marketing move or not (and isn’t it all? ), I’m very appreciative of Bond’s support of gay rights. Besides, the LGBTQ community has joked for years that gay marriage was a big money-maker, and our capitalist society was missing the boat. Every business makes their decisions based on what sells, and Bond could just as easily polarized customers by choosing to do something that backed marriage equality, so it could be considered to be a dicey move by some. I’m not a huge fan of the Bonds–nor do I hate the line–but I really do think this was a nice gesture.